Here's a list of our up and coming Azpects Demo Days. There may be more added to the calendar as they are being booked in. How do you remove Black Spot and White Spot from patios? 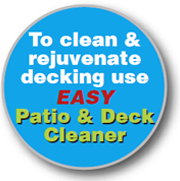 The EASY solution to removing the most stubborn areas of lichen and algae on patios, paths and drives. Whilst visiting Pentagon Jersey we spotted that one of the porcelain patios in the patio display area required rust treatment, we decided to video the EASY4Rust process and have put together this video. Every year as the paving season approaches and begins to get going, Azpects support our stockists around the country by putting on Azpects Demo Days. Azpects are launching a new range of cleaning and protection products which have been designed to make achieving trade quality results available to gardeners across the nation and beyond. Do you remember our EASYGrid driveway installation video from 2017 where we transformed a regular grass lawn into a grass gridded driveway for vehicles? Do you have a new untreated decking area to enjoy but are wondering how to maintain it? We wish all our customers in the past, present and future a very Happy New Year and the best of luck for 2019, it should be an exciting year ahead. Azpects would like to wish all our customers past and present a very Merry Christmas and a Happy New Year. Azpects' own Jeff Carter was at Wix Equestrian Centre in Essex on 9th September to help support this Show Jumping Event in Aid of Cancer Research UK and Mistley Manor Residents. Trade Show season is closing in quickly for the Garden and Landscaping Sectors and this means Glee Birmingham and Landscape Show will be here before you know it. The project, designed to help families in Colchester and surrounding villages with a safe, enclosed and accessible space. Try our new and improved stockist finder You can now put in your local town or city along with your postcode to find local Azpects suppliers. Azpects would like to take this opportunity to thank all our customers in the UK and across the globe for helping us to reach this milestone.